My guys are really into games these days. In fact, the other day a huge box arrived via Fed Ex and I assumed it must be a forgotten Christmas gift that James had ordered for me. But no, it was a box full of about 4 or 5 board games. They've gone board game crazy. The latest one that I've been privy to play is Agricola. It's a German game in which you build a farm over the course of about an hour. The difference in these European games my guys are buying up like crazy and the typical American game is that these are "cooperative" games rather than "competitive." I found a quote on the Internet about the difference. Cooperative games emphasize participation, challenge, and fun rather than defeating someone. Cooperative games emphasize play rather than competition. Right. I personally have not experienced a lot of cooperation from the guys I've been playing with. And James and Daniel seem awfully set on winning and awfully thrilled when they do.Still, they are fun games and I, ever the one to love a good board game, have enjoyed these new "challenges." 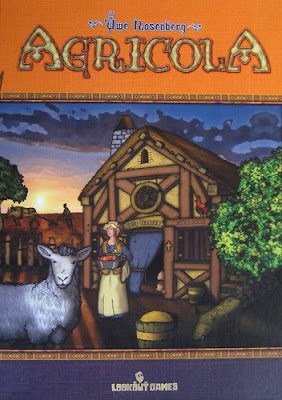 But here's the thing about Agricola (which means farmer in German, evidently). You get a certain number of turns to do things like purchase wood, purchase food, plow a field, sow a field, buy clay (so you can upgrade your house), etc. And with every turn, only one person gets to do most of those things. So if one of your opponents buys the three pieces of wood that are available on that turn, you don't get to. And you need that wood. You need the wood to build fences, you need fences to build pastures, you need pastures before you can buy sheep, cattle or wild boar, and you need each of those animals by the time the game is over. You need all these things because at the end of the game you get points for having them and you lose points for not having them. You need an upgraded house with multiple rooms; more people than you began with; fields that are plowed, sown and now producing vegetables and grain; pastures with cattle, sheep, and wild boar; and ovens and fireplaces. You need to have a lot of stuff. Here's one interesting addendum. You can buy one animal before you have a pasture and put it in your house. Daniel ended the game the other day with a wild boar in his house and he beat me. Personally, I don't think you should be able to win if you have a wild boar in your house. A wild boar in a house does not a winner make! This is James' winning board. This is Daniel's Second Place board. And this is my losing board. So much for "cooperation." While I like the game and will play again, it resembles real life just a little too closely for my tastes. In life James and I have often felt like we were a day late and a dollar short. We're the couple who build a house just as building supplies are going up in cost. We're the couple who takes out a loan for a house right before mortgage rates begin to plummet. We're the couple who gets ready to pay off our debt completely and then has to pay for an expensive surgery instead. And we're the couple who has to pay for a car repair (or two) and a new household appliance right before Christmas every year. We just can't ever seem to get ahead. Life is supposed to be cooperative instead of competitive too. Remember how in the book of Acts the believers in the first church were taking care of each other's needs and looking out for one another. They were doing life together, in cooperation. But too often we turn life into a competition. You can label it cooperative all you want, but in the end, as in Agricola, we tend to add up our points and compare them to the others around us. Do we have an upgraded house or are we still in our starter home? Do we have new cars, one per family member, or do we share a car we paid for several years ago? Have we made investments that are yielding great gain or are we still trying to pay the debt we owe for the "wood" we bought a while back? But many who are first will be last; and the last, first. Jesus and his 12 friends must have played a Agricola too. Sounds like they were familiar with the concept anyhow. I slip into the game playing mode in life every now and then. But, since I don't seem to be destined to accumulate much on this earth, the temptation isn't quite as high for me as it could be. You lose a board game a few times, and it no longer holds much fascination for you. The same with life's little games. Still, I do grow impatient with our inability to even keep pace sometimes. I'd love to really get on top of things, you know? What about you? Are you busy trying to accumulate and never seeming to get ahead? Let's take heart with Jesus' words today. The first shall be last. I kind of think that means the losers will be winners too. And I'm holding onto that....in Agricola as well as life!